This horse's head was an unusual request - the chainsaw sculpture it is based upon is a sculpture which is about 30 feet tall entitled 'Still Water' by Nic Fiddian Green, now on permanent display at Marble Arch, London. This one was sculpted from an Oak tree at the entrance to the driveway of two houses in the Mobberley area of Cheshire. 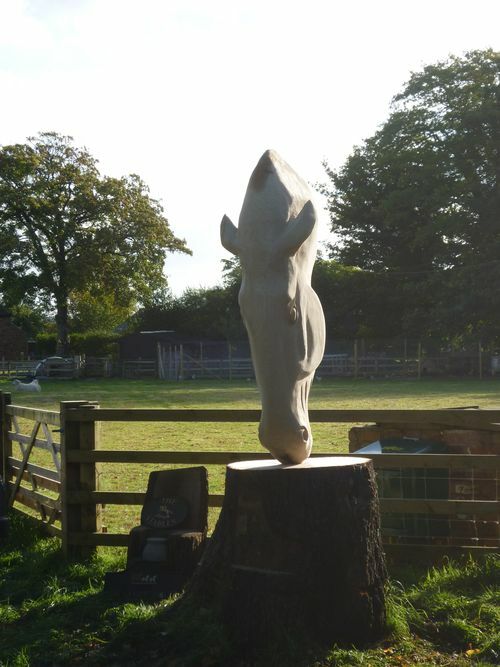 The horse is attached to the stump by two stainless steel rods which give the impression the horse's nose is just touching the base.